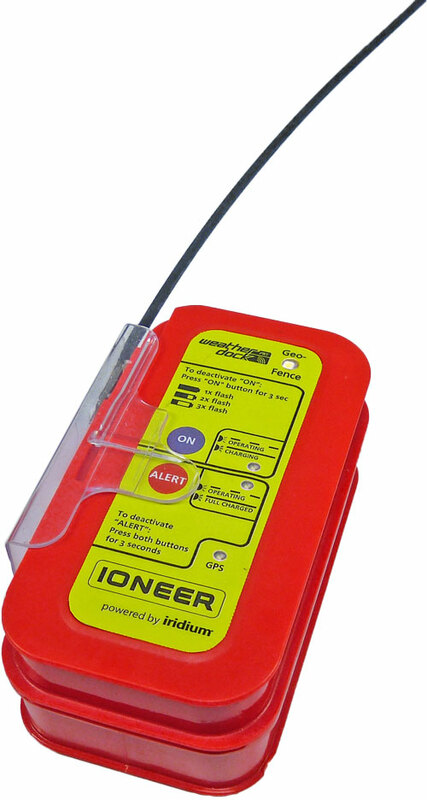 The IONEER system allows persistent locating and monitoring of vessels or other moving objects in all areas via VHF technologies. The palm-sized position transmitter is reliable working with the AIS Class B CSTDMA (Carrier Sense Time Division Multiple Access) functionality and IRIDIUM® sat network. After activation the IONEER transmits position reports in a pre-set time interval to a coastal cordination-center to show current location of each fleet vessel. The default position reporting is done on special customized VHF frequencies or on regular AIS frequencies by using the AIS CSTDMA technology. SAT communication via IRIDIUM® satellite network is provided in addition. Intelligent recharging of batteries with a special charging station (easyCHARGER A121). Battery runtime is depending on the pre-set transmission intervall. Intelligent recharging with a fixed solution by means of connection to 9-32VDC vessel engine. Intelligent recharging with persistent external power supply. Suitable also for small artisanal fishing vessels without electrical power supply. As soon as a pre-programmed distance from the coastline is overrun, the IONEER unit switches automatically into SAT-Communication via IRIDIUM satellites. AIS based Communication can be done bi-directional: Ship-to-SAT-to-Shore and vice versa. By triggering the alert button, additional to the regular position report an official AIS emergency message will be send out on both standard AIS frequencies to reach every AIS receiver within transmission range of the vmsTRACK-PRO-CS. Real-Time-Knowledge of „who and where“ is very important in administration of coastal fishing fleets as well as for coastal border security issues. By transmission of the unit ID and additional special names the „Friend or Foe“ identifying is easily possible. Weatherdock´s technology allows the creation of restricted or limited entry zones. These special areas can be programmed into the unit. This “Geo-Fence-Functionality” has many applications, one of them is to help in the protection of our planet but it is also very useful for Coastal Fisheries Management. Using the Bluetooth®LE connectivity of your smartphone, it is possible to remote control the vmsTRACK-PRO push buttons and to see the LED status display. Android® and IOS® apps are available free of charge to use this functionality. Via Bluetooth the usage of the fisher catch report app is the perfect solution for easy catch reporting regarding IUU requirements. If the unit will be stolen or tampered, an intelligent high tech solution will trigger a flashing LED to inform the vessels captain. A special information message is send to control center immediately in addition. The vmsTRACK-PRO-CS is able to store waypoints of thousands of nautical miles for better transparency of areas of activity acording the IUU guidelines. The vmsTRACK-PRO unit can be individualized by means of pre-programming additional data e.g. ship name, type of vessel and area of activity into the unit for transmission.